Where to start on this review? While I can find nothing technically wrong with this book, the story, or its characters… nothing in it really moved me. The mystery itself was not terribly compelling, but I did enjoy the journey a few characters take in terms of growth and self discovery. That one line provided a heaping serving of context. This was not going to be a flashy, technology-driven, CSI-style mystery but rather an old-school gumshoe story full of interviews and “hitting the streets” to find clues. Initially I was excited. But as the pages turned, and turned, and turned I kept waiting for something exciting to happen. It never really did. There were a lot of sub plots (too many maybe?) and the author did do a great job keeping them all straight. Or dare I say tidy? The victim’s widow, Amanda, was a refreshing character. The tale of her less-than-love-filled marriage was sad and rang with truth. Sims starts out as a dedicated detective, but as the story moves forward you’re hit with more of a sense of frustration and dissatisfaction with his role in the precinct. His relationship with his dog Lancelot was extremely endearing. Listening to him hash out theories with the lovable mutt was possibly one of the book’s finest moments. Again, the journeys Sims and Amanda take over the course of the book were endearing. They’re the reason I kept reading, not the mystery or the numerous other cases Sims is saddled with in the course of the tale. 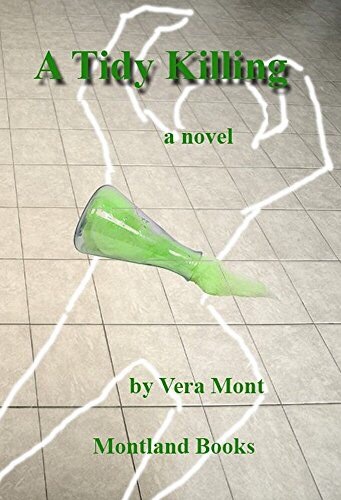 So, if you’re looking for a flashy mystery A Tidy Killing is not that kind of book. But as a journey of self discovery and growth, with a murder as the backdrop, this is a fun read. Subscribers to Kindle Unlimited can check the book out for free HERE.